The Lensic Theater capacity is 820. The Foundation reserves approximately 200 tickets for staff, Board members, guests of the author, and for community outreach. Community outreach tickets are given free of charge to students from high schools, colleges, and universities, and to non-profit community groups. To date, we have given away over 15,000 tickets for educational purposes. Approximately 620 tickets are available to the public for each event. 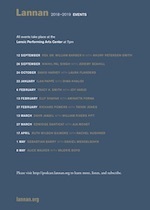 Tickets can be purchased in person or by phone at the Lensic Box Office and on line at www.lensic.org. The tickets are evenly divided between those that are available for purchase through the Box Office and online. Ticket purchases are limited to 4 per person. We realize that many of our events sell out quickly and that not all who wish to attend are able to get tickets. We hope that the above explanation is helpful in understanding how tickets are distributed. Thank you for all your enthusiasm and for being such a great audience!